Talk about "hiding in plain sight." 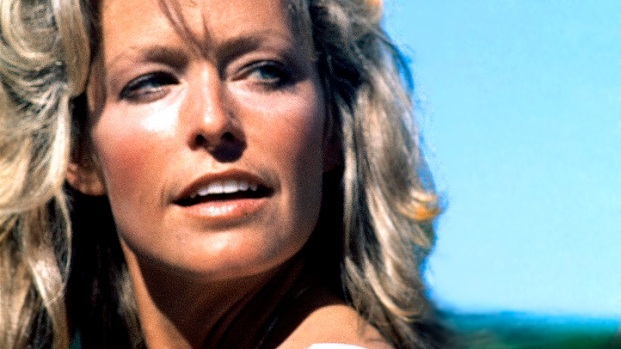 When actress Farrah Fawcett died in 2009, she bequeathed several works of art to her alma mater, the University of Texas. One of them, a portrait of the actress done by Andy Warhol, apparently never made its way down to Austin, and the school is claiming Fawcett's longtime companion Ryan O'Neal has it. How do they know? They saw it hanging in his bedroom during an episode of "Ryan & Tatum: The O'Neals." In the lawsuit, the University stressed that it is concerned with preserving history and not interested in monetary gain. Has Tatum O'Neal Found Peace With Her Father Ryan O'Neal? In the new reality show, "Ryan & Tatum: The O'Neals," Tatum and her father Ryan struggle to come to terms with their checkered history, so what advice do Billy Bush and Kit Hoover give Tatum about how to mend their relationship that she thinks might work? "The enduring value and public interest in the Warhol portraits is a testament not only to Mr Warhol's talent and artistry, but also to Ms Fawcett's status as a cultural icon," asserts the University in the suit. "The Warhol portrait is an irreplaceable piece of art for which legal damages could not fully compensate." O'Neal, meanwhile, maintains that the portrait in his bedroom is one of two Warhol did of Fawcett, and that it is rightfully his. A spokesman for O'Neal, Arnold Robinson, sees the suit as "ridiculous." "Ryan O'Neal's friendship with Andy Warhol began 10 years prior to his meeting Farrah Fawcett," said Robinson in a statement. "When Ryan introduced Andy to Farrah, Mr Warhol chose to complete two portraits of her, one for Ms Fawcett and one for Mr O'Neal. Mr O'Neal looks forward to being completely vindicated in the courts." The portrait, or portraits, are estimated to be worth close to $30 million. O'Neal has been making headlines a lot lately for his controversial actions - first for admitting that he mistakenly hit on his own daughter, Tatum, while at Fawcett's funeral, and then for claiming that Tatum O'Neal herself may have been the cause of Fawcett's cancer.